A) Security ID is a unique identifier of a security within Moneydance, it's not something that has any existence outside of Moneydance. You can ignore it or you can just make it up. C) Ticker Symbol - Be sure to use the symbol used by Yahoo FInance including a "." and a letter for stocks from non American exchanges (for example a stock on the London exchange will end in ".L"
D) Price - This value can be changed either from the "history" window or by using the extensions that automatically update prices. E) Value prefix and suffix - By default holdings are measured in shares as in equity holding. 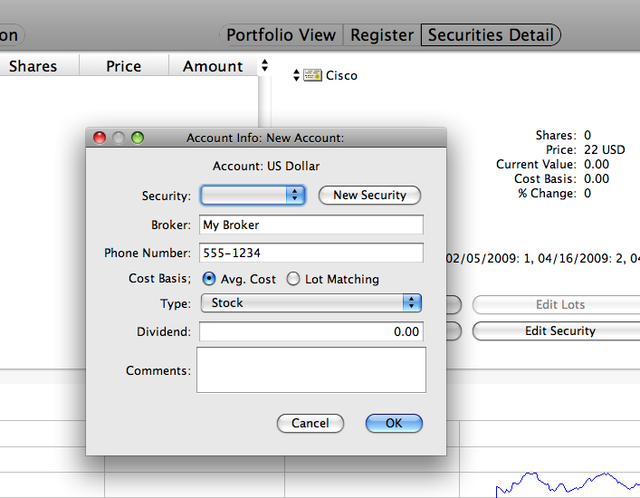 If you have some other kind of denomination for your holdings (such as contract for options) you can enter them here either as a prefix or a suffix to the price per unit of the security. 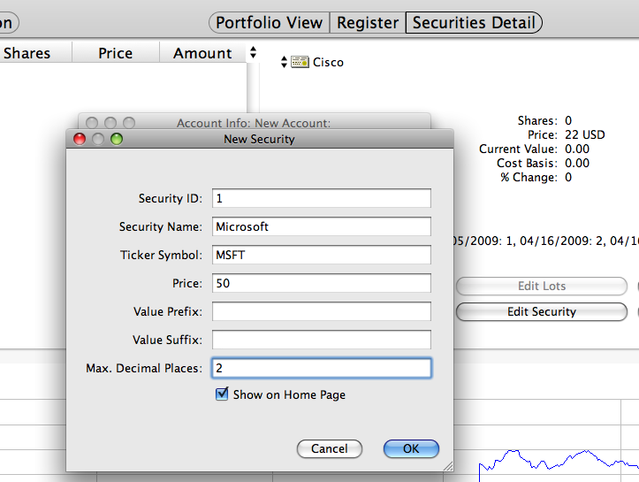 Then fill out the rest of the security information identifying it as a stock, bond, CD, option contract etc and the particular information unique to that type of security. Most of this information is just used for identification purposes and is not used in calculations of any kind within Moneydance. Note: after adding a security you may need to add a history of price value for this security. you can do that either by editing the history from the "history" window or you can add and use the extensions that automatically update price information from Yahoo Finance. These extensions are the "stocks/forex quotes autosynchronizer" and "Yahoo stock quotes". They are used in concert, the former configuring how the latter is used. To add these extensions choose "extensions" from the menu bar -> add -> from the internet. Once the security has been added, from the register you may enter transactions that reflect your holdings for this security. If you are adding initial holdings, you can enter buyxfr transactions with the category "initial holdings" as a custom income category to reflect that you already possess these securities at the creation of this account within Moneydance. If you are entering a transaction that is not an initial holding, be sure to enter as the category in the 2nd line "transaction fee" or "commision" to reflect applicable broker fees.